“Texas Mexican” is the cuisine that has evolved over centuries in the region immediately North and South of the lower Rio Grande River. The cuisine is deeply rooted in the indigenous cultures of what are now northeastern Mexico and the United States central and southern Texas. Its history begins in approximately 900 AD, the period when anthropologists can identify distinct native communities and cultures. By 1500 there were hundreds of thousands of inhabitants in Texas living in communities with various languages and customs. Their cuisine predates both Texas and Mexico and is characterized by the types of Native American ingredients it shares with sister regions like Baja California, Oaxaca, Yucatán, Jalisco and others. Some of these ingredients are chiles, maize, quelitre, beans, tomato, potato, squash, cactus, and maguey. The cuisine is nonetheless also distinct from its sister regions because it developed in a geographic region with specific climatic and soil conditions. Having specific river fish, seafood, flora and fauna, the culinary ingredients are therefore distinct: turtle, quail, sotol, pecans and others. From 1821 to 1848, this region was the state of “Coahuila y Texas,” Mexico, and so it is understandable that the indigenous Texas natives, along with their food, came to be known as “Mexican.” But it is erroneous to locate this food history as “south of the border,” for it existed north of the river long before it was a border. The history of our cuisine is grounded radically in the land that is on both sides of the lower Rio Grande river. Texas Mexican cuisine is therefore at home, in its roots, in central/south Texas. Texas Native Americans underwent colossal changes when the Europeans entered their homelands. Facing terrifying diseases, wars and social upheaval, they were subjects and creators of their destinies as they found ways of adapting to new, dangerous circumstances. In the process they created strategies not only for survival but also for strengthening and expanding their community. Food production and cooking were integral to this strategy. Over time, cooking techniques invented ways to marry native ingredients with those of the immigrant Europeans, the result being a continuously evolving, ever creative and unique cuisine. We used wheat as a thickener, mixing it with chiles and spices. We incorporated pork and lard into cooking of corn gorditas and tamales. We developed recipes that found delicious, beautiful harmonies between local and foreign spices. Our “Chile con Carne” is a prime example of this harmony, since the success of the dish depends on the foreign ingredients of cumin, black pepper, garlic, onion and beef serving as a sumptuous backdrop to the carefully selected array of chiles, each chile offering its distinctive flavor. In the early 1900’s a unique variation of Texas Mexican cuisine was developed in restaurants throughout Texas by Anglo entrepreneurs. Building on the success of Native Texas, Indian, business women who sold prepared foods in open-air tables in San Antonio, the Anglo entrepreneurs established indoor restaurants serving similar native food. They were able to meet newly written health regulations with which the native business women were unable to comply. The outdoor tables and the women disappeared. The food served in those restaurants has come to be known as “Tex-Mex.” Since the food was intended to cater to Anglo customers, cooks found ways to make it palatable to Anglo-European tastes. They used high amounts of pork fat, lard, and also took advantage of the industrial, processed yellow cheeses developed by Kraft in 1914. The menus of these restaurants were narrow in their offerings and did not delve into the larger repertoire of the Texas Mexican cuisine that was being cooked and enjoyed in homes at that time. Some examples of such “Tex-Mex” restaurants are “The Original Mexican Restaurant” in Forth Worth, the one in Waco by the same name, and the one in Dallas, also with the same name. None of them were related to each other, sharing only the name. These restaurants were highly successful in Anglo communities. Around the 1930’s Mexican American male entrepreneurs, descendants of the original Texas Indians, also started opening up such restaurants with great success. Any authentic cuisine, if it is truly at the heart of a community and family, is ever new, ever evolving. Contemporary Texas Mexican food continues the tradition of cooking with ingredients tied to this land, adapting to new contexts, and exploring new avenues of taste. We renew by remembering. Prior to 1528 we used vegetable and nut oils, since pork and lard did not exist here. Cactus, pecans, sotol and quelitre are being rediscovered. Since we have embraced pork, onions, watermelon, and tamarind as culturally ours, we find innovative ways to enjoy them, exploring techniques of sous-vide, molecular and raw. We are about community and a celebratory, nourishing table. 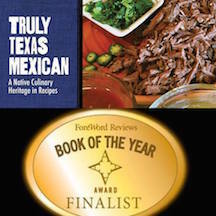 We are the Mexican-American, Texas Indian, Texas Native American chefs and cooks. Conscious of the horrors of our violent history, ours is an aesthetic grounded in economic justice, the true context for peace. What makes us artful chefs with the clarity of mind and palate to cook delicious Texas Mexican food is being true to the flavors developed by former cooks. Not ignoring their contributions, we learn about them and build upon them. We develope a heightened awareness of justice in food production, in purchasing and in wages to food laborers. As we are more mindful of the economic context, the land and the environment, so will we grow in our understanding of the character, texture and flavor of our ingredients. We will develop a loving finesse in our cooking technique, an appreciation of the humanity of all who come to our table. The desire to comfort, to heal and to enjoy. Very interesting! I always knew that modern Tex-Mex was only somewhat related to indigenous Texas/Mexican food, but never really looked into it. Why do so many chefs tell us that Tex Mex cooking was born with the advent of settlers to north of the Rio Grande border? This is great Adan. Very informative and well thought out. It makes me want to go home and make some guacamole, which I will in fact do so this evening.